Wanna know the biggest problem I had with my Applesauce Bread this morning?! I only made one loaf! What was I thinking?! And then, “Mom, did you make anymore?” say all the boys as they peek around in hope at all the countertops and at the oven. So, be warned, you might want to double this recipe if you’re going to wake your family up some morning to the delicious smell of this bread baking. And, it is a great way to wake your family, I promise! Make a well in the center and add applesauce, eggs, and butter. Pour batter into one buttered bread pan or stone. Bake at 350° for 45-55 minutes or until a toothpick inserted in the middle of the loaf comes out clean. This is one of our favorite fall recipes! Put some in the oven, and your whole house will smell like fall. Or Christmas. Or comfort. Or all of the above. Hint: If you have some apples that are beginning to get mushy and no one wants to eat them – simply core them and put them into a food processor or blender. Puree them, then stir them into this recipe. Works like a charm! the recipe doesn’t say what to do with the honey? If you’re using honey instead of rapadura/sucanat…just add it with the liquid ingredients. A PINK iron?!!! Sounds fun, more fun than mine anyway! Thanks for stopping by & commenting on my blog. Yum-o! We had good breakfast this morning! :-) This was soooo good! (I added pecans to it too.) Thanks for sharing all these great, healthy recipes! :-) MMMMM! Just came across this recipe. We are allergic to eggs, do you think we could make it without? I have an egg replacer powder. Just wonder what you think. Thanks so much. This recipe is delicious! I made it to go with our lunch the other day. Thank you for sharing it. Also, I really enjoyed your series on Real Food. I appreciate all your work and effort you put into writing that. I blogged about your bread, if you are interested in reading it @ simplycara.com. Thanks so much for this recipe, we all love it!!! Last time I made it I had run out of nutmeg, I substituted pumpkin pie spice – YUM!!!! Oh, my son would love this! Going on the menu for next week….thanks! This is such a wonderful recipe! I have made it once using applesauce and once using mashed bananas (which would make it banana bread instead of applesauce bread, really). Both times it has been sooooo goooood. In fact, I like this banana bread recipe more than any other that I can recall. The texture is perfect. Thank you! I used your recipe today but made it with pureed peaches instead. I also had a small bit of rapadura left and used half graham flour and half white. It turned out really well. Not overly peachy. You should try it if you haven’t already. This looks great! I used 3 egg whites and low-sat. fat butter. It is in the oven right now! I made this yesterday for the first time and after the loaf disappeared (mostly by me) I decided to make more today. I have applesauce muffins in the oven as we speak! And since I have some bananas on the counter that would be perfect for banana bread I may try that too. I was thinking about it so I was glad to see that Rachael tried it with success! Thanks for the wonderful recipes! I wanted to come back and add that this has become my “go-to” muffin recipe! I’ve done applesauce muffins, banana muffins, pumpkin muffins, and even blueberry muffins (just add blueberries at the end). I love them and so do my kids. And I really love that they don’t have refined sugar. I use honey. Just wanted to say thank you again! I made my first batch this morning with grain from my new grain mill too – thanks in part to your “letter” and some of your information. I am very grateful for you today!!! AMAZING! It was soo good! Unfortunately I had to use white flour but I’m SURE it will taste just as heavenly with wheat! Hmm…what a bummer. One difference is maybe that store bought flour does tend to be different the freshly ground. Maybe next time try half white half whole wheat. I bet they’d taste great that way and at least have SOME whole wheat in them. Also, not sure how long you baked them, but I’d probably go 20 minutes at 400 degrees on the muffins. Hope you try again and enjoy the results more! Thank you so much for this recipe. My kids wanted to make muffins and I have no fruit in the house because it’s nearing grocery day and this recipe was perfect as muffins! We make this bread often with pumpkin pie filling or apple butter, my boys love it. Made this Monday night with my husband. It was delish. Can’t wait to make it again. Thanks! We just made these and they were sooo good!!! Thanks for sharing the recipe! you were so right, should have made more loafs…….it was gone before i could try it, but the good news, my hubby and son devoured it………..so obviously will be making more. I love your recipes……..it makes me feel like a chef, lol. I just made this last night and popped it in the oven this morning…it DID smell so good and we all enjoyed it. I did double it and it was the perfect amount with a slice or two left to go with my coffee tomorrow morning. (; Thanks for sharing this great recipe. The recipe doesn’t include soaking directions, but I found them another page on this site for quick breads. I soaked butter, flour, and a little buttermilk, wasn’t sure how much buttermilk to use?? I soaked overnight and used “just enough” buttermilk. I am new to this soaking thing, and I followed the directions, but it was really hard to combine ingredients later.I had a lot of flour lumps, and didn’t get the rise I would have liked. Also, the bread had a lot of trouble coming out the pan. Any advice? I used honey instead of rapadura. It sure did smell good baking though! Hmm, maybe use more buttermilk next time to make the mixture a little bit sloppier (but not too sloppy) and you could add the butter too. Just make sure the butter has cooled off after you melt it so that it won’t kill the culture in the buttermilk. I’m trying to figure out how to soak this. If I soak the butter, flour, and a little buttermilk… how much is a little? lol Also, do I then need to take something else out of the recipe so that its not too watery? Actually I’d use kefir to soak… Its just not quite making sense to me though. Thanks for any help! I’d say just add 2-3 Tablespoons of buttermilk (or kefir) would do the trick. I don’t think it will be too watery that way. Great recipe! Easy to make and it goes fast. I will be making this again. My family devours your Applesauce Bread whenever I make it! Thank you Laura (my husband thanks you to)! Tonight I made them as muffins, and they turned out terrific. I doubled the recipe, greased the muffin tin (because I figured that they would stick to paper liners) and baked them for 17 minutes at 350 degrees. They were delicious and not dry at all. A double batch yielded 20 muffins. Thank you for making me the most popular person in my house today! I took your advice and made a double batch. All four of my men LOVED IT!!!!!!!!!!!! This is the most moist and delicious bread! I used apple butter that someone had made for me in place of the applesauce and it was so wonderful! Will definitely make again and again! Just discovered this recipe and we made it for breakfast – yum! I used maple syrup instead of honey. Delicious. This is terrific! The only change I made was use 1/2 cup sucuanat and 1/4 c. dark brown sugar (my family is still getting used to the flavor of sucunat). This turned out fabulous – definitely making a double batch next time. I only made one loaf to try it out and its all gone. Kids loved it. I love the whole site and look forward to trying alot more of the recipes. Will be making this when my pumpkin bread gets done baking :) Thanks for sharing! Just made these into muffins using organic brown rice flour. Turn out perfect, soooooo good!!! I’m super bummed because I made this bread and while cooking my whole house smelled amazing, the bread smelled amazing when it came out too. However, my loaf was a lot light than yours is in the picture and it was really dry for some reason, and not much taste. The smell far exceeded the taste. Any suggestions? I’d love to make it again but would like a moister sweeter taste. This is a new staple in our family! Thank you for the recipe! I’m up at 4am to make it for my dad who is visiting! This is so delicious! We like put melted butter and sugar on top right when it’s fresh out of the oven. Bad I know, but yummy! Thank you for sharing this recipe, it was really easy and the bread turned out great! I used all-purpose flour instead of whole wheat and put some dried cranberries, soooo delicious! Mmmmm its in the oven right now! Cannot wait to try this out! =] I love finding things to make on here that my 14 month old will like. She likes applesauce, she likes bread. Seems like a win win for us! I just recently found your site and have been baking my way through your sweet treats. Thank you for posting such delicious and healthy foods. Our whole family has been enjoying them. 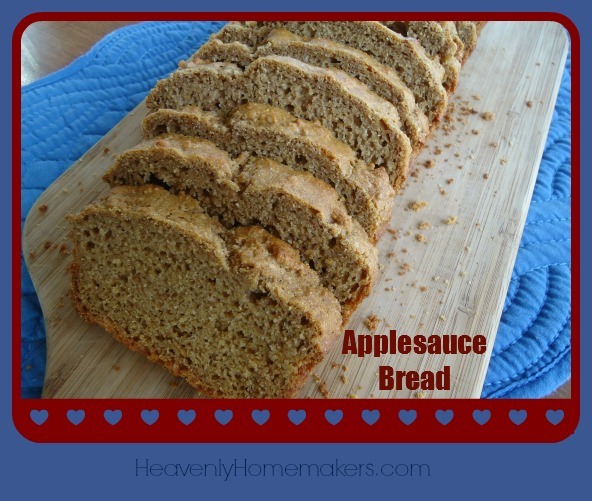 Also, I linked your Applesauce bread to my family blog, I hope you don’t mind! I leave out the butter and use a full cup of applesauce – or pumpkin or roasted butternut squash. I also add raisins or currants – it always disappears! Why would you call this healthy? Its got a lot of calories… @ 270 per serving & has butter when many applesauce recipes allow us to get rid of that heinous source of high calorie fat? There are so many truly healthy alternatives… butter free… and at about 70 cal per serving out there – plus, after having tried both – taste better. I realize that many people are opposed to the use of real butter and feel that it is unhealthy. I disagree with this idea and do not hesitate to use whole, real foods including butter. You can certainly substitute applesauce for the butter and this recipe will work just fine. So Laura, when your bread recipes call for whole wheat….are you mainly using hard white and not hard red? When would you use the hard red? I use mainly hard white wheat. You CAN use hard red for any of them, I just really don’t prefer the taste or heaviness of it. I have made this bread into several muffins many times. A few weeks ago, I added about 1 cup of frozen blueberries. Nummers. This week I added 1/2 cup of diced cranberries and the juice and zest of one small orange. Nummers again. The next time I make them, I am going to add some frozen blackberries. Made it last night and it was delicious. My kids and their friends kept coming back for seconds (and thirds). Thank you for posting this! I made this last night but with cocount oil instead of butter and honey instead of rapadura. I also sprinkled a little raw sugar on the top at the end of baking. Delicious! That sounds great. I figured that I would use honey instead also, and I use coconut oil all of the time, so I may try it that way. Did you add those alterations into the ‘well’ of liquid ingredients, I’m assuming? That was my only hold up. Making this for the first time this afternoon & I’m thinking of adding in some ground flaxseed for extra protein and/or oatmeal. Do you think it will be too dry? I’m not sure, but just in case, you could add an extra egg to help add some moisture! This recipe is a hit with our family! I’ve featured the recipe link on our site’s “In the Kitchen” page. I’ve not tried soaking the flour in this recipe, so I’m not entirely sure! Could you use maple syrup instead of honey? I’m allergic to honey and don’t readily have rapadura on hand. My, my, MY! We just made this with a couple small changes and BOY is it delicious. I used fresh ground, soft whole wheat flour, half butter and half expeller-pressed coconut oil, and pear butter in place of the applesauce. I also found I only needed half the honey and it’s still plenty sweet. I’m glad I doubled the recipe, my 3 boys and I just went through an entire loaf! =) A keeper for sure. The pear butter gave me a thought .. Trader Joes had Pumpkin butter, how good would that taste? These are great as muffins as well!! It made just over 24 mini muffins, and I baked them at 350 for 12-13 minutes… PERFECT! YUM! Thanks for the tip! I was just going to make these and wondered about muffins. I was reading down through all the comments, wondering if anyone had made muffins. I’m going to try it! This turned out great!!! My little one really liked it! I just made this as muffins and they were fantastic. I made two dozen in the afternoon and by the end of dinner, there were only 5 left and I had to print the recipe twice for visitors who happened to come over when they were just coming out of the oven. Great recipe, definitely a keeper. Thanks!! I was wondering if you can freeze this?? We make it all the time and just wasn’t sure how it would reheat. You sure could freeze it. It should reheat just fine. Yep, should have doubled it! It barely lasted a day with my 3 little ones. Awesome recipe!! Do you happen to know how much protein is in a serving of this bread? I’m looking for new things for breakfast that have a good amount of protein. Thanks for the suggestion. I tried it, but it comes out with crazy numbers. flour suggestion. If I can find some that is safe for my peanut/tree nut allergic child, I will get some. I was curious what size loaf pan you have… all I have is the Pyrex loaf pans, and that bread looks substantially bigger (I can adjust easier if I know what size you have.) Thanks in advance! I just found this recipe. It is fantastic! Thanks for sharing! Just received the Sunbeam cupcake maker for my birthday. Was a little skeptical because I don’t like to use boxed mixes, so I thought our favorite applesauce bread recipe would be the perfect 1st try. This recipe came out beautifully in it – moist and delicious just as when I make them in the oven! So now I can let my 7 year old (with supervision of course) make these too! I tried this recipe this morning….so moist and delicious. You really inspire me to cook even more healthy meals for my family!! I have made this many times and each time I do it turns out great! My family loves it. We put cream cheese on it and send it in their lunches too. Thanks for the great recipe! I made this for the first time this morning. I did make a few changes based on our preferences- I replaced the rapadura/honey with turbinado sugar, the butter with plain greek yogurt, and the eggs with a ground flax/water mixture. It turned out great!!! I will be making this again. Thanks for the great recipe. Oh, and I replaced the applesauce with my homemade cinnamon applesauce. I was just wondering, how much greek yogurt did you use instead of the butter. Would love to try that idea and have no idea how much to use. I replaced it at a 1:1 ration- The recipe calls for 1/4 c. melted butter so I used 1/4 of vanilla greek yougurt. Hi. Sounds really good. Have two questions: Can you use agave syrup instead of the honey and can you substitue margerine for the butter. I’m thinking I will use my homemade apple butter since I have plenty of that and no applesauce. I will just leave out the cinnamon and nutmeg. What do you think? or not… It might be amazing! Wondering….should it work okay for me to substitute the wheat flour for almond flour? Our family needs to eat gluten free and I am trying to learn how all the alternative flours work. I’ve always used boxed goods, so this is a challenge for me. Thanks! I’ve not ever used almond flour so I’m not sure it would substitute one-for-one. Let us know if you try it and it works! I need to add this to next week’s breakfast menu! You can easily turn this bread into muffins. It makes 12 muffins. They were done after 23 minutes in my oven. I can’t wait to try this. I have a question. What else can I use to substitute for the butter? My little one is highly allergic to dairy and both she and my husband are sensitive to coconut. I would rather not use dairy free margarine, however if that is the best choice I will use that. I’d bet you could use olive oil. While I prefer butter and coconut, another whole wheat bread blogger used primarily olive oil even with in her sweet breads. I’ve been to her cooking shows and it tastes just as good. I love olive oil too, but don’t think of using it in sweet breads. But it still tastes delicious! Can’t wait to try this! Have my sugar free home made applesauce and will use the yogurt instead of butter. Healthy muffins! I made this bread today and for a double batch I added 1 C. oats added to 1 C. boiling water (let sit for 10 minutes or so). It made it moist! It also is moister with 1/2 C. sour cream or plain yogurt added to a double batch! (I’ve also added both the sour cream and the oats.) This might help the people who are having it come out dry. Mine also comes out dry without the addition of sour cream or oats or both. Thanks for the recipe! If I were going to make this gluten free, do you know if I should use an all purpose gluten free flour blend (like Amy’s from SSGF), or is there one flour that work as well as the blend? (I know you’re not a GF website, so, maybe I should ask Amy?—-can’t expect you to be an expert on all things)! Just saw your gluten free tab! Do you make your own applesauce for this and similar recipes? My kids love this recipe in muffin form! I am so glad to stumble upon your website. It has so many great recipes that even I can follow. I’m not the best cook and was very frustrated with my inability but reading over your recipes makes me feel at ease. So simple and very few ingredients, I love it. I made this bread today and I had to pat myself on the back, it looked amazing when I looked in the oven. It also smelled so delicious. I haven’t tried it yet, kinda scared but I’m hoping it tastes as good as it smelled and looked. Thank you for having a great website. I didn’t know cooking could be fun and exciting. I’m loving it so far. I have made the hash browns and plan on making different recipes this week for dinner. It’s tough as you said being on a budget. Slowly but surely I am transforming before my very eyes. Thank you! Thanks for this one Laura! It’s been on my list to try and I learned from your lesson above and tripled it. I made 2 loaves and 12 muffins. Only had AP flour and spelt so used those with a little flax seed mixed in and served with honey butter. Very good with 2 loaves to freeze! Thank you! I made this recipe into 12 muffins yesterday. They only took 26 minutes in my oven. So yummy! I just made this tonight. Followed the recipe exactly, using honey as sweetener. Its one of the best quick breads I’ve ever made! Perfect sweetness and texture. So so delicious, fast, easy. Simply awesome! Thank you!! Just wanted to say we have made this bread several times and it goes sooo quick. So yummy. A family favorite..thanks so much for this recipe! Clicked from your crock pot suggestion today….. gosh your kids were little on this one! The applesauce bread recipe is soooooo good. I usually throw in a mushy banana and it is just the BEST! Now to give the crock pot a try… hmm!